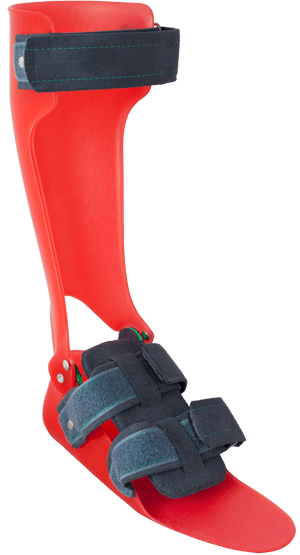 Ambroise is proud to be able to provide the Ankle Foot Orthosis (AFO) line of sister company SWIFT orthopedics. With these orthoses, Ambroise is once again in the frontline of innovation. SWIFT produces custom-made Ankle Foot Orthoses (AFOs, also known as ankle brace or ankle splint) for people with paralysis around the ankle and foot. 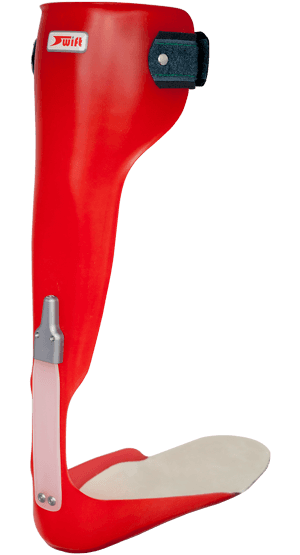 SWIFT is the first company in the world to come up with technology that is able to provide a well fitted custom made AFO based on just three digital photographs of the lower leg and foot. That offers great benefits to you as a client. You don’t need a cast of your leg anymore. The measurement process is much less dependent on the person actually taking the photographs and it’s a lot quiker. Production is also much faster. Ambroise and SWIFT can finish the AFO witin five business days, so you’ll be up and running before you know it. There are various models and designs available, allowing for the best fitted solution to your clinical needs and personal wishes. For example, there is a wide choice of prints and colors. 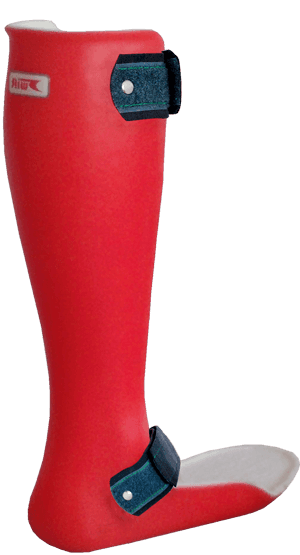 Questions about the AFO? Please contact us. Swift was the first in the world to develop a successfull technique to make a well fitted custom made Ankle Foot Orthosis (AFO) based on three digital photos. All we need is a photo of the back of your leg, the outside (as shown in the image), and the inside. 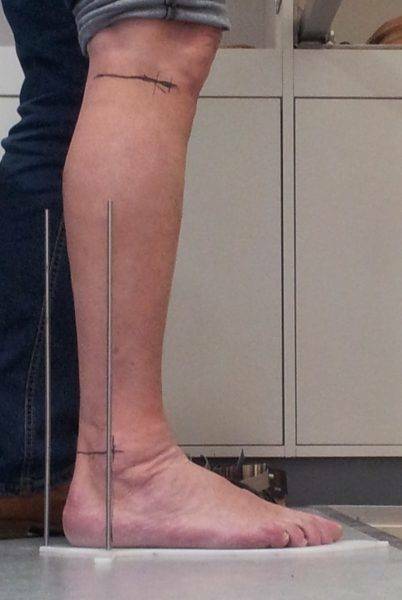 Your foot is positioned on a reference board and anatomical markers on your leg are indicated. With these three pictures, Swift’s software can reconstruct a 3D digital model of your leg and foot. This model is the basis of the Swift AFO production process. Download the Ambroise Photo Measurement for the AFO or visit the manuals page for more information. 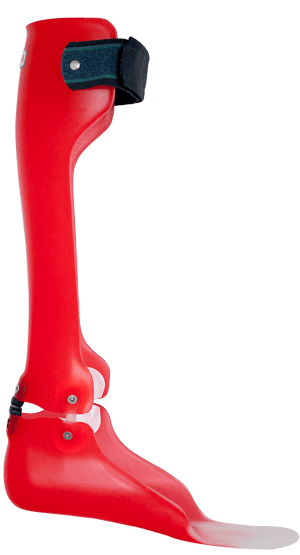 On the 3D digital model of your leg, the chosen model of the Swift AFO is superimposed and scaled to your leg. From that information, the computer runs a CNC milling machine that creates a positive model of your lower leg combined with the AFO. That model is the base for actual production in the workshop. The Swift AFOs are all made of high quality PolyPropylene (PP) through vacuum molding technology. A sheat PP is heated in the oven until it becomes deformable. Next, this sheat is vacuum drawn over the individually customized mold of your lower leg, ankle and foot. The AFO is cut out and finished off. Of course, the Swift software can also calculate how long your locking strap should be, so it will be matched to the length of your AFO. The SWIFT AFO is completely ready to fit when leaving the Swift workshop. Swift can do this swiftly, hence the name! Just five working days after receiving all the required information, your AFO is ready, in a box, on its way to your orthotist. Your orthotist can advise which options best fit your situation. If you want to talk to Ambroise’s clinical experts about your specific situation, please feel free to contact us.